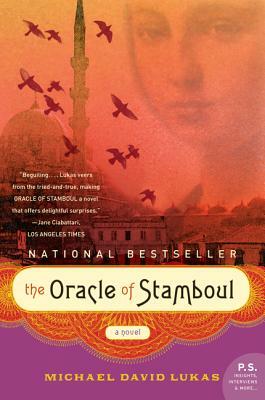 Set in the heart of the exotic Ottoman Empire during the first years of its chaotic decline, Michael David Lukas’ elegantly crafted, utterly enchanting debut novel follows a gifted young girl who dares to charm a sultan—and change the course of history, for the empire and the world. An enthralling literary adventure, perfect for readers entranced by the mixture of historical fiction and magical realism in Philip Pullman’s The Golden Compass, Orhan Pamuk’s My Name is Red, or Gabriel García Márquez’s One Hundred Years of Solitude, Lukas’ evocative tale of prophesy, intrigue, and courage unfolds with the subtlety of a Turkish mosaic and the powerful majesty of an epic for the ages. MICHAEL DAVID LUKAS has been a Fulbright scholar in Turkey, a late-shift proofreader in Tel Aviv and a Rotary scholar in Tunisia. He is a graduate of Brown University and the University of Maryland, and his writing has been published in the Virginia Quarterly Review, Slate, National Geographic Traveler and the Georgia Review. Lukas lives in Oakland, California, less than a mile from where he was born. When he isn’t writing,he teaches creative writing to third- and fourth-graders. Visit him online at www.michaeldavidlukas.com. A prophecy foretold the birth of a girl like Eleonora Cohen. Do you believe in mystical propositions such as prophecies? Do you think the events surrounding her birth were truly foretold or just coincidence? Why do we in the West dismiss the idea of prophets and prophecies? Have we lost something in doing so? What were your impressions of Eleonora? What made her different from others, especially other children? What was the significance of the purple and white hoopoes in the story? Why did animals behave as they did around Eleonora? Do you believe animals can sense things differently—perhaps better—than humans? Eleonora's life touched those of many adults, including her father, Yakob. Talk about their bond. How did the various characters in the story view Eleonora? How did her father see her? What about her tutor, the Reverend James Muehler ? Her father's friend and her guardian, Moncef Bey? The sultan and the other people in his palace, including his mother and his counselor, the Grand Vezir? What about the American journalist? What impact does Mrs. Damakan, the Bey's housekeeper, play in the course of the girl's early life? When she mastered reading, Eleonora's favorite saga was a seven-volume epic called The Hourglass. What lessons did she learn from the novel? How did the book impact the events that followed? Do you have a favorite book that has influenced you? Why was Ruxandra, the girl's stepmother, suspicious of her gifts, and especially hostile to her reading? Why are so many people afraid of learning and knowledge? Are some people too wise for the world? When it comes to books, Eleonora's tutor, the Reverend Muehler tells her guardian Moncef Bey, "I have never held the novel in much esteem. It is a genre for idle women and romantic young boys. Such frivolousness, even a masterpiece such as The Hourglass, cannot have any real utility. But I would think that if she were given more serious reading material—philosophy, history, rhetoric—it might do her some good." What do you think of the reverend's condemnation of the novel? Can we learn as much from fiction as nonfiction? Should we teach more literature to young people? Does it matter if they read novels or not? "If there was one thing she learned from The Hourglass it as that you should always follow the dictates of your own heart." Do you agree with this? What happens when we don't follow the dictates of our hearts? When might we choose not to do so? When the Reverend Muehler and Yakob met on the ship, they exchanged stories of their travels. "It goes without saying, perhaps, that a missionary and a carpet dealer would encounter vastly different segments of a city's population." What kinds of people would both meet? Might their lives have crossed if they hadn't shared a cabin on the boat to Stamboul? Do you think their meeting was fate—part of the prophecy surrounding Eleonara's birth? Do you believe in fate or destiny? How does choice impact fate? Speaking of destiny, Eleonora pondered the losses she had suffered while rereading The Hourglass. "She had a small comfort in the sentiment that our paths in life are laid according to a plan more grandiose that we could ever conceive or comprehend." Do you share her sentiment? How does believing in this offer solace? The city of Stamboul is more than just a backdrop to this novel. It is a character in itself. How did Eleonora imagine Stamboul to be? What were your impressions of the city? Has there ever been a place that has sparked your imagination as Stamboul did for Eleanora? Early in her stay in Stamboul, Eleonora wished she could stay in the city forever. Do you think she does? Or will fate take her somewhere else? Can someone of her gifts truly hide in plain sight? The sultan disagreed with his closest councilor on the methods of effective governance. For the sultan, "an effective ruler needed more than anything to maintain a proper distance from the events that occurred within his domain. If he allowed himself to fret over the particulars of every battle and infrastructure project, he would never be able to focus on the decisions that truly mattered." Do you agree with this? Can a leader become too caught up in the details? But might ignoring details be detrimental for good leadership? Why was the sultan willing to grant Eleanora an audience? What advice do you think she gave him? If you heard that the president met with someone like Eleonora, what would you think? What is the reaction in Stamboul after word of Eleonora's visit spreads? When Eleonora discovers something incriminating about the reverend, she isn't sure whether or not to confide in the Bey. "Plato would seem to think she should. Truth is the beginning of every good to the gods, and of every good to man. Then again, there was Tertullian. Truth engenders hatred of the truth. As soon as it appears it is the enemy." Discuss both of these viewpoints. Which do you side with more? Why does the truth engender hatred? Another philosophical debate Eleonora has is between doing something wrong and not yet doing the right thing. "Was there a difference between these two sins?" she wonders. How would you answer this question? After her tragedy, Eleonora stops speaking. What does being "voiceless" offer her? If you chose not to speak for a few days, what might you learn? Do you think it would make you a better listener? Is history important? Who ultimately writes our history? Do you think Eleonora changed the course of this particular empire? Why did Eleonora make the choice she did at the story's end? Was she walking away from her "fate"—or was she ultimately saving her life?